Scottish Ministers have laid regulations in the Scottish Parliament setting out the provisions which will regulate the retention and killing of Atlantic salmon in Scottish waters for the 2019 fishing season. The new gradings will come into effect from 1 April 2019 - read more. The majority of the work involved with replacing the old site with our new one has now been completed. There is some tidying up still to be done and you can see an explanation of the work involved and the latest situation on our new System Status page. This also has a form for reporting any new issues to us. Please help us by using it, rather than emailing us direct. We now have a much leaner and more up to date site which will make future development for you so much easier. Thank you for your patience during the changeover period. Well done angling supremo Graham Ritchie for this "stunning" Spey salmon. River Dee We landed some lovely fish on the river last week. This week has also begun in the right manner, I make it four by midday! The final tally of twenty-four takes us to sixty for the season. Read more. 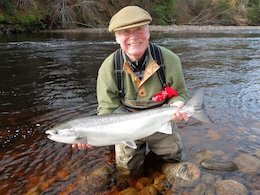 River Spey Delfur had their first of the season on Monday, a fish of around six pound from Hollenbush. Availability is continuing to be added every day to our site. This week rods from Border Esk, Dee, Don, Findhorn, Nairn, Ness, Nith, Spey and Tay have been added - find fishing. This month scientists from the Tay District Salmon Fisheries Board began planting ova from reconditioned adults within the hatchery. The first batch went out to the top of the re-watered section of the river Garry on the 19th February. Another 50k reconditioned eggs went out to the Glas Coire burn. This tributary of the re-watered section of the river Garry has also had significant engineering work done to allow adults to enter the bottom end and stocking to be done through its length. Again this work will be followed up with surveys during the summer. 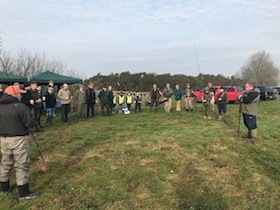 The second year of stocking this area and summer surveys last year showed successful stocking and fry doing well - read more. 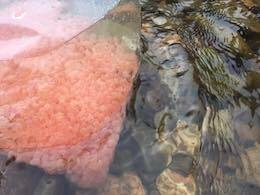 It is recognised that stocking has a valuable role to play in the development of salmon stocks in the district, but that it must be managed carefully to avoid negative impacts and waste - read more. 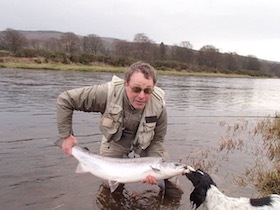 The first salmon of the Findhorn season was caught last week in the Soldier's Hole pool on Altyre Estate, River Findhorn on a Altyre Dog, 1" tube fly by Leslie Tyson. Ian Neale about to return the first salmon off the river this season, 2019. If you are heading for this weekends Glasgow Angling Centre's open weekend today (Friday), then be sure to look up the team from FishPal who will be onsite and would be more than happy to chat to you about all your fishing needs. This year's event will take place on the 1st to the 3rd March 2019 and is promising to be a cracker. Come and meet some of the country's best-known anglers including Ian Gordon from Hardy, TV personality Paul Young, Paul Proctor from Trout Fisherman Magazine and MacKenzie, Steve Souter from Abu Garcia, Stevie Munn from Guideline and Hywel Morgan from Daiwa. These are just some of the top names who will be attending, but every tackle brand in the industry will be in attendance. They will be available for you to ask questions and to get help with your fishing. 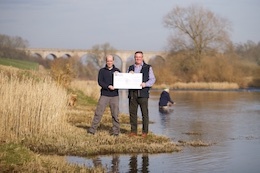 It was a pleasure to meet up with Kenny Galt from the River Tweed Commission and also Eoin Fairgrieve to hand over a cheque for £1,060.50 from anglers donations made whilst booking fishing via the FishTweed site. Both Kenny and Eoin have been involved with Tweedstart for over 10 years now, a programme designed to introduce young people in the Scottish Borders into fishing - a fantastic cause and delighted to be able to help fund this really important initiative thanks to the help of Tweed anglers. Kenny and Eoin asked me to pass on their personal thanks to all the anglers who chose to donate to this great programme - the funds will really help as they set out their plans for the year ahead. Caledonia Fly Company have over 539 Salmon flies within their new collection and have added some new, exciting patterns this season. The first of these being the new look Friggi Flies. There is also a range of copper tube flies for Spring fishing. 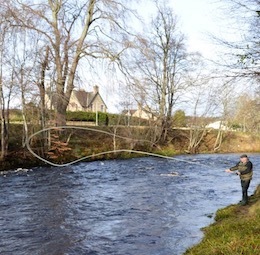 The river Nith was opened by the DGAA angling association at the Carnsalloch beat of the river, just north of Dumfries. Turn out was good and great to see all ages attending the opening day celebrations. The Nith river has settled well after the winter and Grayling sport has remained good for most anglers. 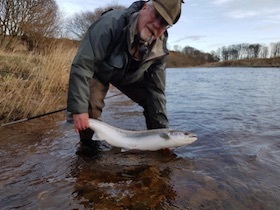 River Annan also opened on Monday and could well be worth a cast. Find Fishing. Alness River. The Alness Angling Club celebrated the traditional opening day of the river on Monday 11 February. The new season marks the river achieving a category 1 grading in recognition of the strong conservation efforts of the Club members. Members of the club were piped to the river bank by Miss Corrin Macleod where they were provided with refreshments. The river was blessed in the traditional way with a quaich of whisky by the Club Secretary Mr Ivan Munro and the first cast of the season was made by Andrew Easton. After the ceremony and a period of fishing by the assembled members, the river was closed until 15th March in keeping with the conservation policy to provide safe transit for kelts returning to sea. The Club is looking forward to a strong season this year. 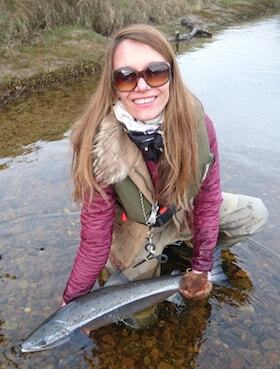 A Morphie angler with a lovely Feb 2019 salmon. Meikleour, Claire Mercer Nairne (aka The Boss) called in for a rare cast before the afternoon school run because it was such a nice day. A few minutes later Claire caught a beautiful ten pounder in the Castle Pool. A few minutes later she is away in the car - job done! Please mail your Fish photos to info@fishpal.com with a name, where you caught it and what fly/lure you caught it on. Please note we are not in a position to post your photos if the fish is on a bank, stones.etc. Ideally in a net, water or as close to the water if possible, cheers Tom@fishpal. I look forward to seeing your catches!